Rivaled but not surpassed by Barcelona, Madrid offers the finest workmanship and best values in Spain. Although no longer extremely inexpensive, top-quality goods still cost less than equivalent items in most other countries. Among the best buys are art and antiques. Dozens of galleries feature the output, especially paintings and graphics, of a highly professional art scene. Many antique shops specialize in a specific commodity such as glassware or ivory. Spanish couturiers are recognized for fashionable designs sewn in suede and antelope. Also in demand internationally are high-quality leather goods including gloves, handbags and shoes. 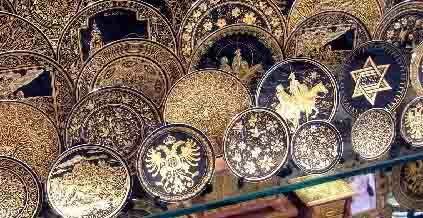 Toledo is the center for damascened ware-black steel inlaid with gold, silver and copper threads. Smaller items such as bracelets and pendants make good gifts to take home. Other expert jewelers create distinctive pieces from Majorcan pearls, the finest artificial pearls in the world. 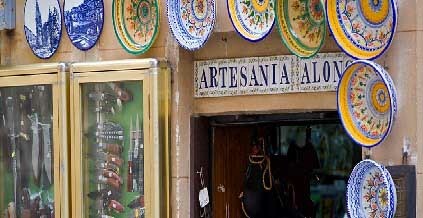 Even though Spain is now the fifth most industrialized nation in Europe, popular handicrafts are still obtainable. Many stores stock classic Talavera and Muel ceramics, which can also be purchased in the towns of the same names. Valencia produces handcrafted wooden furniture in a variety of modes, and Alicante exports its exquisite handmade toys all over the world. Shops and boutiques, initially open from 8:30 to 1:30, reopen after lunch and do business until 8 or 9. They are usually closed on Sundays and holidays. Department stores offer the convenience of one-stop shopping along with a wide range of reliable goods. Two chains, Galerías Preciados and El Corte Inglés, each with several stores in Madrid and outlets in other major cities, often sell at prices lower than owner-operated shops. 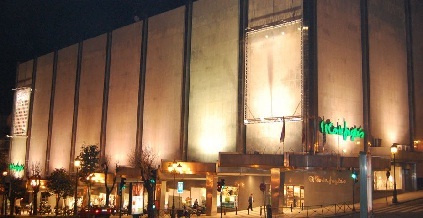 Celso García is the most exclusive of Madrid's department stores. Unlike some of the smaller shops, department stores maintain regular business hours and sell at fixed prices. Interpreters are generally on hand to aid non-Spanish speakers. El Rastro, Madrid's flea market is a Sunday-morning must. Only after several visits is it possible to get the hang of this in-door, out-door emporium offering both the practical and improbable for sale and resale. Although antique dealers and other knowledgeable professionals frequent this institution, less experienced buyers can also pick up bargains from the constant flow of goods. Buying aside, the fun lies in mingling with the holiday crowd. Vendors start clearing their stalls and locking up early, around 2 p.m.